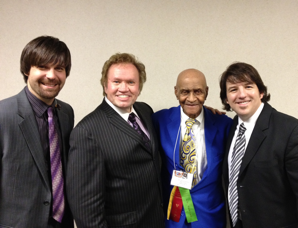 Nashville, TN (January 25, 2012) – Exciting male trio and Mansion Entertainment recording artist, THREE BRIDGES, was honored to be a featured performer at the 20th annual American Gospel Quartet Convention held in Birmingham, AL January 17 – 21. Three Bridges performed for this exciting event on Friday, January 20th. Three Bridges’ music is rooted in traditional Southern Gospel as well as “Black Gospel” music. This blended style has given the group a unique flair and has opened many doors for them to share their exciting and energy-packed stage presentation. Their latest release, Christmas Must Be Tonight, was recently nominated for 2011 Special Event Project in the Absolutely Gospel Music Awards.